Wedding Cufflinks. Add a dash of novelty style with this pair of silver golfers cufflinks. Jewellery Sets. Chosen by Emilia Rose prides itself on our unbeatable service throughout your entire purchasing experience. (CK646 Cricket Ball). Ideal for any Cricket Enthusiast. Supplied in Manufactures Quality Cufflinks Box (8.5cm 4.5cm 3.5cm). (sold as non pristine - due to slight imperfections around stitching marks). 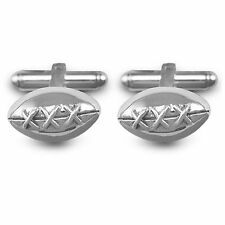 Here you are buying a matching Cufflinks and Tie pin set. 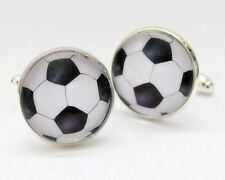 Fit for any football fan, who wants to look smart but also show there support for there team. 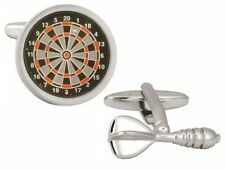 The Tie pin and Cufflinks are made from quality nickle plated brass. 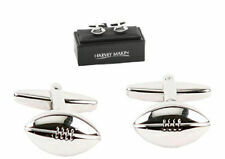 rugby ball shaped cufflinks supplied in Harvey Makin presentation gift box great gift idea made from metal not plastic look and feel decent set, a good purchase . Very High Quality Swivel Back Cufflinks. 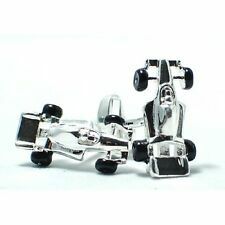 SILVER PLATED F1 Racing Car. Supplied in a smart box. 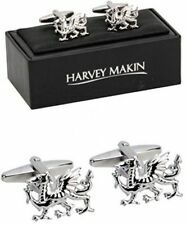 decent quality cufflinks these are the Harvey Makin ones distributed in the UK, not the lower price version look and feel quite substantial, great value novelty pair standard size supplied in presentation box . 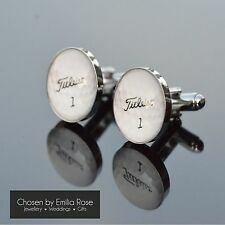 Pair Of Round Unisex Golf Player Cufflinks, Silver In Colour With Glass Finish. Dispatched with Royal Mail 2nd Class Large Letter Free-post, U.K. Seller ! 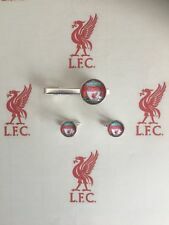 Really nice quality and an absolute must for any football fan. Also available as keyrings and pin badges (subject to availability). A fabulous example of early 1990’s Cabouchon jewellery. 18 Carat gold plated, great quality finish. I am not absolutely sure what the hat is but it looks like either a construction helmet or it could even be a Polo helmet. These Cuff links will come in a gift box and would make an excellent gift for any occasion. New and super quality. Beautiful hand made HULL art cufflinks. Really nice quality and an absolute must for any Cricket fan. Also available as keyrings and pin badges (subject to availability). They each featurea polo player in action on his horse --just look at the detail in the photograph! Each link is an impressive. silver grey slim square lidded box. (6cms square x 2.5cms deep-as per the photographs) , witha black interior. Really nice quality and an absolute must for any Golf fan. Also available as keyrings and pin badges (subject to availability). Also available as keyrings and pin badges (subject to availability). Premium quality rhodium plated cricket bat cufflinks. Cricket Bat Cufflinks. The perfect gift for any cricket mad man! Really nice quality and an absolute must for any hunting, gun dog, hunter or gun dog fan. Also available as keyrings and pin badges (subject to availability). Four Aces Cards Gambling Casino high quality cufflinks. Really nice quality and an absolute must for any casino fan. Also available as keyrings and pin badges (subject to availability). NOVELTY CUFF LINKS WITH GIFT BOX NEW UK. A gift set containing a pair of Novelty cuff links. Beautifully manufactured and supplied in a presentation box. Cuff link Size approx: Length 15 mms. FREE GIFT BOX, IDEAL FOR PRESENTS. Really nice quality and an absolute must for any pool or snooker fan. Also available as keyrings and pin badges (subject to availability). Really nice quality and an absolute must for any casino fan. They would make an ideal gift. Quality Pair of Novelty Cufflinks. Pair of Cufflinks. Sports Car Design. in the Design of a Sports Car. Supplied in Smart Presentation Box. Silver Tone. Free Organza Gift Bag included. Very desirable, would make a beautiful gift! BOXING GLOVES. We hope you love your item. Material: Silver Plated & Glass. It should be used as a guide but not gospel. Your patience is appreciated if your item has not arrived when estimated. ONE PAIR SUPPLIED. GOLF CLUB BAG. in a gift bag. (CK750 Cricket Wicket). Supplied in Manufacturers Quality Cufflinks Box (8.5cm 4.5cm 3.5cm). Ideal for any Cricketer. TED BAKER ENDURANCE SILVER CUFFLINKS MINI DUMBELL SHAPE SIGNED ~ NEW !!! FABULOUS UNISEX SILVER CYLINDRICAL DUMBELL SHAPED ENDURANCE CUFFLINKS. RARE NEW TED BAKER ENDURANCE SILVER CUFFLINKS LIKE MINI DUMBELLS SIGNED.! WONDERFUL WORN WITH YOUR TED BAKER FORMAL SHIRTS OR THOMAS PINK SHIRTS.! 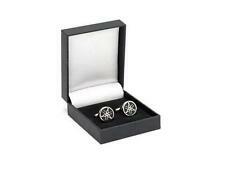 Pair of beautiful quality silver plated cufflinks with gift bag. Beautiful hand made art cufflinks gold. Hand crafted and presented in a velvet gift bag. (CK941 Bicycle Chain Cufflinks). Supplied in Manufacturers Quality Cufflinks Box (8.5cm 4.5cm 3.5cm). JustforMoo Cufflinks are manufactured from high quality materials and supplied with a black velveteen bag to ensure they're kept safe when not being worn.